This is a purely functional map showing the locations of cities, points of interest and routes. I'll make a more pretty illustrated one at some point like in the old thread, and maybe some rough drawings of some of the towns. 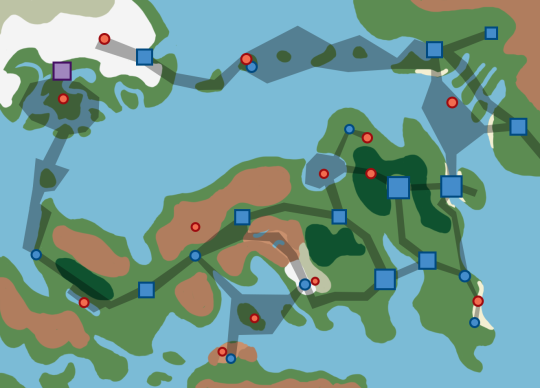 Blue squares are cities, blue circles are towns, red circles are points of interest (caves, forests etc), dark strips are routes. A: Perido Town is a little coastal village where the player’s adventure begins. It is quaint, with the scent of the sea on the air. B: Citrelle Town is the farming market town where the player and their friends find three Pokéballs bearing the mark of Spinele City’s Pokémon Lab that seem to have been stolen. It has a Pokémon centre and a small marketplace. C: Spessar City is a hilly town home to a popular Pokémon Zoo where experienced trainers can work to earn money and purchase some of the Pokémon on display. D: Across the Iridescent Bridge from Spessar City, Malack City is known for its docks and its artsy modern buildings, including the Malack Aquarium that houses the first Pokémon Gym the player encounters, led by the water-type trainer Iuan. E: E: Carnelia City is the region’s capital city and is actually split into two halves: The Southern Bank is a more traditional, historical district with older buildings, parks and the famous restaurant that is the second gym, run by normal-type trainer Lucinda. The Northern Bank is far more modern, populated mostly by young adults who enjoy the various clubs and bars, including the fifth gym, dark-trainer Zahra’s nightclub-gym. F: Clinolor Town is a chilly mining settlement that has little else to offer but its deep mines, the focus of much local folklore. G: Tormalos City is an old industrial capital that has in recent years become far more environmentally-friendly, replacing its old factories with green, tree-filled parks and wind farms. Its oldest foundry remains standing though no longer functional, and houses Frederick’s dual type fire/grass gym, the third the player will challenge. H: Lapiville Town is a tiny mountain village situated entirely inside the caverns of the Cosma Mountains, lit by the colourful luminescent crystals that fill the place. I: Quarta City is the location of a prestigious school that offers diplomas in Basic Pokémon Studies, required for entry to the Spinele City Institute. J: Spinele City has been more or less taken over by its world-renowned academy, the Spinele City Institute. Only trainer with at least three gym badges and a diploma in Basic Pokémon Studies are admitted, to train up and challenge the fourth gym leader, the genius psychic master and Pokémon Professor, Huberta Hawthorn. K: Larimar Town is a tiny village in the shadow of Starshine Hill, where the region’s famous Observatory stands. L: Amethis City is a coastal resort with dazzling beaches and a fairground esplanade. The sixth gym leader, Aurora, trains her flying-type Pokémon atop the city’s lighthouse. M: Garnate City is famous for its architecture, including its cafés, museums and canals. Beryl’s steel-type gym is found inside the city’s famous modern art gallery. N: Marcast City, as well as being the gate between the Farroh and Kalos regions, has a large renowned market that sells items from all over the world. O: Zirken City runs along a pretty canal and is known for its wharves and restaurants. The city has no gym, but does feature the ancient Battleburg Castle where trainers can take part in consecutive battles to earn prizes. P: Oligo Town is an ocean retreat built atop and below the cliffs of Zephyr Isle, popular for its waterfalls. Q: Fiorar City sits around a small bay near the snowy tundras of north Farroh. It has pretty docks, and the final gym of the region’s league, ghost-trainer and singer Isobella’s festival park. R: Liolide Town is a tiny village on a chilly coast, best known for its holiday park frequented by trainer from all over the world. It also gives access to the safest route to the Pokémon League. T: Helione Town is a quiet retreat next to the ancient natural monument of the Colossus Steps. S: Situated atop the beautiful scenic fjords that make up victory road, Farroh’s Pokémon League is also a great performance space. Trainers challenge ice-trainer Neville on an ice rink, poison-trainer Vivien on a dance floor, dragon-trainer Regan in a concert hall, bug-trainer Olivia in a gymnastics space and finally Champion Eugene, the player’s older brother, on a theatre stage. U: The Clinolor Mines are steeped in local fairytales and legends. The deepest parts are said to be inhabited by a mythical Pokémon. V: Mount Cosma is the highest point of the region. Few trainers have been known to reach its foggy summit. W: Elbian Forest once filled the whole area around Carnelia City, but in recent decades parts of it have been flattened to allow for expansion of the region’s metropolis. X: Larimar Cove is a nature reserve inhabited by rare Water-type Pokémon. Y: Falos Reef is a colourful coral reef that bridges the sea between mainland Farroh and its eastern reaches. Z: Zephyr Bluff is the most treacherous of the cliffs on Zephyr Isle. Γ: Glacial Hollow is a freezing cavern in the tundras near Fiorar City. Δ: Lake Lore is a long, deep lake said to be home to an ancient legendary Pokémon. Θ: The final challenge for trainers wishing to take on the Pokémon league is to traverse the fjords, cliffs and caves of Victory Road, filled with some of the strongest trainers in the region. Π: Larimar Observatory sits atop Starshine hill. Trainers can use the telescope to observe the night sky and learn about certain legendary Pokémon. Σ: Stepstone Cavern is a small flooded cave halfway between the mainland and Colossus Steps. Ψ: The Colossus Steps are an ancient geographical phenomenon, said to be used by vast Pokémon ages ago to cross the sea. Φ: Fossilised Pokémon fill the renowned Archaic Grotto. There seems to be no access to its deepest most ancient areas. Last edited by Zeph; 04-16-2016 at 09:01 PM.